I love autumn fashion, I really do- that's number 1083 on my list of things I adore about all things autumnal- just in case you was wondering. I know I do like to bang on about my love of cosy nights, and how it's now acceptable to wrap yourself up like a cocoon in your duvet, because well...it's cold okay. But, believe me when I say big chunky scarves, heeled ankle boots and fur everything are my very favourite things about the colder season. So this is how this outfit came about, I chucked all of my fave pieces together, and badda-bing-badda-bang, the perfect autumnal outfit. A fur gilet and roll neck jumper- that was a bargain at £6, may I add- make for the cosiest of all cosy outfits when paired together; every girl needs this combination of comfort in their lives. 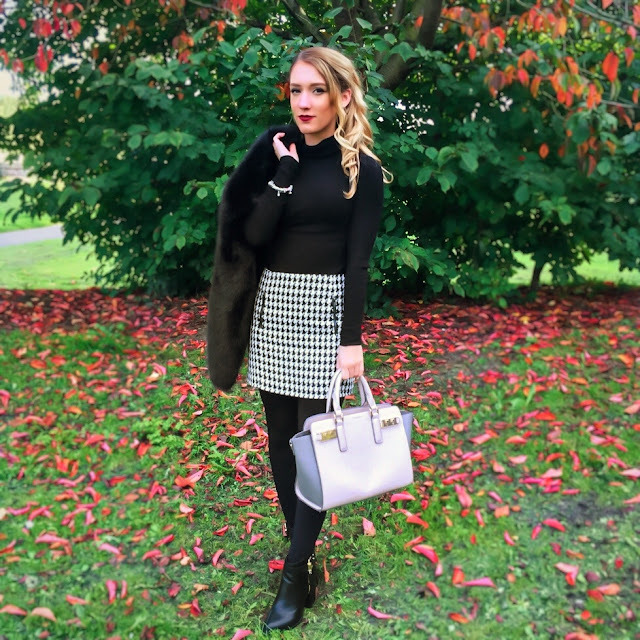 The dogtooth skirt is also a winner as it goes with pretty much anything. You know, it's one of those pieces of clothing you just need hanging proudly in your wardrobe! I would mention my ankle boots, but as they made an appearance in my last post, I shan't- they're gorgeous, so they speak for themselves anyway. So, that's me signed out as Gok Wan for the day, what would your ideal autumnal outfit be?